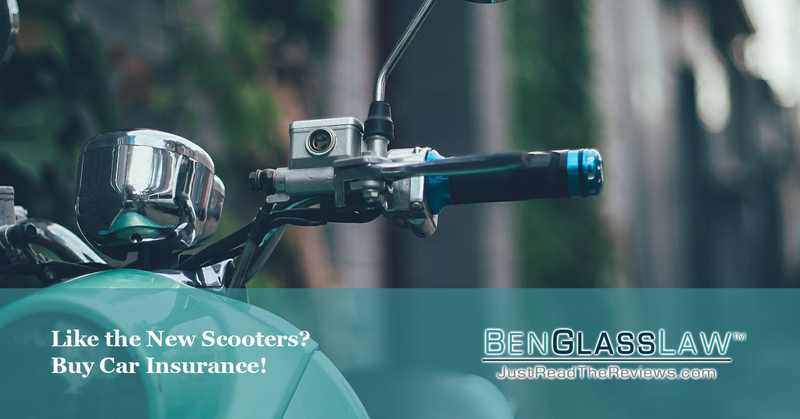 If You’re Going to Ride those Cool New Scooters Around Town, Please Check Your Car Insurance First! I’m sure you’ve seen them all about town – those dock less scooters. With a swipe of a credit card, they provide you easy, quick access to the entire area that you live. They are truly a brilliant business idea. But with every new invention comes side-effects. And, as was just written about recently in the Washington Post, these new scooters are keeping ER doctors fully employed. Simply put, they are dangerous! I hate to be a “Debbie Downer,” but if you’re going to use one of these nifty new gadgets, you have to appreciate the risk. And I wouldn’t be doing my job if I didn’t remind you that before you step on one, make sure you are properly insured. For any accident, health insurance is so important. If you break a leg, or twist an ankle, your health insurance will help protect you from devastating your savings account. But another thing to check is your car insurance. But why does my car insurance matter? Your car insurance protects you if you weren’t at fault for your accident, and you were injured due to a car (or other automobile) that struck you. For instance, if you’re legally proceeding through a cross walking and a negligent driver hits you, your own car insurance may protect you. What exactly should I look for in my car insurance? You should specifically be looking for how much Under-Insured Motorist Coverage (UIM) that you have. UIM protects you in the event that a negligent driver that injured you isn’t properly insured. I always recommend everyone to get One Million ($1,000,000) in coverage. This may seem like a lot, but often times it only costs you only a couple more hundred dollars a year. And, if you find yourself severely injured, medical bills add up quickly. There’s really no reason not to buy this much insurance.